We need your help. 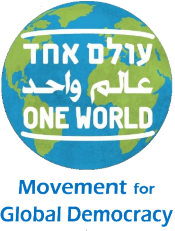 One World is a non-profit organisation and our activities depend mainly on voluntary work and donations from many private supporters – people just like you! ‘Olam Ehad’ Account No. 65490034, Branch 806 Lev Dizengoff, Bank Leumi (10). IBAN: IL13 0108 0600 0006 5490 034 Routing Number: IL010806 Swift Code: LUMIILITXXX Bank Name: BANK LEUMI LE ISRAEL B.M. "If I can get freedom for India now [...] empire idea dissolves and world-state takes its place, in which all the states of the world are free and equal, no State has its military, there may be a world police to keep order in the absence of universal belief in non-violence." "I am a citizen, not of Athens, or Greece, but of the world." "A federation of all humanity, together with a sufficient means of social justice to ensure health, education, and a rough equality of opportunity, would mean such a release and increase of human energy as to open a new phase in human history." "Faced with the globalization of economy and finance, the mounting imbalance in the distribution of wealth, and asymmetric threats to international security, the answer that is provided by the cooperation of nation-states is often no longer enough. There's an increased urgency that political institutions and instruments of participation and democracy also go through a process of globalization. That's why I support the establishment of a UN Parliamentary Assembly." "Today the universal common good poses problems of worldwide dimensions, which cannot be adequately tackled or solved except by the efforts of a public authority [...] which is in a position to operate in an effective manner on a world-wide basis. The moral order itself, therefore, demands that such a form of public authority be established." "I have no doubt in my mind that the World Government must and will come, for there is no other remedy for the world's sickness. It can be an extension of the federal principle, a growth of the idea underlying the United Nations, giving each national unit freedom to fashion its destiny according to its genius, but subject always to the basic covenant of the world Government."